Of course, in order to actually test the Arctic Cooling Accelero Hybrid, we must first install it. I had on hand a bone stock, reference NVIDIA GeForce GTX 680, a card which is in my opinion the perfect candidate. The GTX 680's stock cooler isn't bad, but it can get a little noisy if you start overclocking the card at all, and it's not as robust as the cooler on the venerable GTX 580. To be fair, that card had a much higher TDP than the GTX 680 does. The first step was just getting the existing cooler off of the GTX 680, and NVIDIA doesn't make it easy. 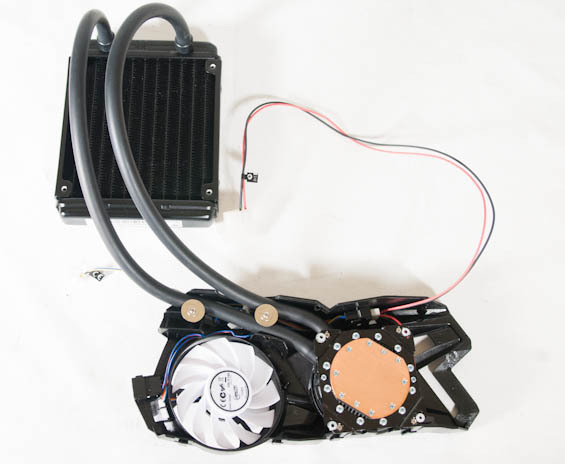 The 680's cooling comes in three pieces: the outer shroud, the heatsink, and the baseplate. The shroud is easy enough to remove, secured with a total of six Phillips head screws. Disconnecting the radial fan requires removing another internal Phillips head screw with a precision screwdriver, and then the heatsink comes off by removing four more Phillips head screws from the rear of the card. Of course, the baseplate itself isn't so kind: there are fourteen T6 Torx head screws on the rear of the card that must be removed, along with an additional three Phillips head screws attached to the I/O shield. With the original cooling system removed, you'll need to clean the thermal paste off of the GPU die, and Arctic Cooling recommends using an eraser to gently remove any residue that may be on the RAM and VRM dies. After doing so you'll want to safely set aside the video card, as we now need to work on one of the two major parts of the Accelero Hybrid: the shroud. The plastic shroud has kind of a goofy shape and doesn't feel particularly sturdy, and I kind of wish Arctic Cooling had gone with a bit more staid and practical of a design. In the above photo, in the ring to the left of the 80mm fan are three circular rubber pads which have to be applied. These dampen vibration from the waterblock. And above is the waterblock installed into the shroud. This is an involved process, unfortunately. The easy part is getting the waterblock into the shroud and wrapping the tubing around the plastic wedges inside. 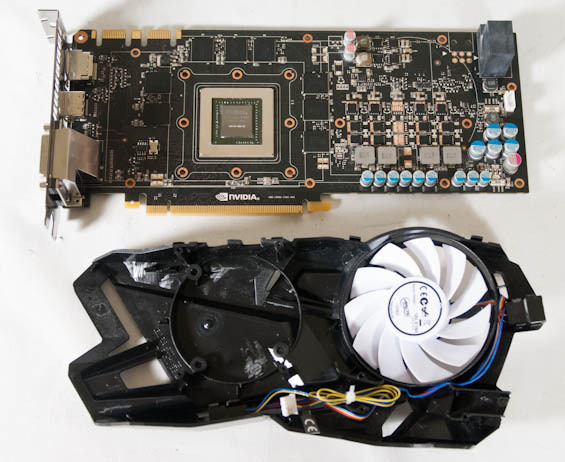 There are three channels for the tubes to go through; the orientation in the image is for the GTX 680, while other cards would shift both tubes down a channel. The waterblock is screwed into place, and then the tubes are held in place by metal washers mounted into the shroud. The four clear spacers covering the mounting points of the waterblock have to have adhesive applied to their backs, and they're all roughly the size of a Grape Nut. This requires a ridiculous amount of precision, and I hope your hands are steadier than mine. Arctic Cooling could've done us all a huge solid by including these spacers pre-adhered like the rubber pads used to cushion the waterblock instead of making us remove tiny circles of double-sided adhesive. You also have to refer to their included table to see which spacers to use, as certain cards require 1.5mm spacers (like the GTX 680) while others require 4mm spacers. From there, you'll have to connect the power plug off of the waterblock to a header inside the shroud located just above the block.